In a week in which the FA has made some big accusations and called for serious action to be taken after the ugly scenes in Serbia, events at Hillsborough last night are a great example of the old adage that perhaps people in glass houses shouldn’t throw stones. The FA must now take swift and decisive action against all involved in the disgraceful scenes seen in the second half of the game between Sheffield Wednesday and Leeds United if it is to retain any credibility on the international stage when it, in the opinion of this writer, quite rightly stands before the powers that be in UEFA and FIFA and calls for strong action to be taken against the Serbian FA. With an investigation now underway, it seems only a matter of time before the official account of things becomes known and punishments handed out accordingly, and in this respect the FA must first acknowledge the fact that for their credibility to remain untarnished they must look further than just the actions of the single Leeds United fan who has done potentially irreparable damage to the reputation of the club he would claim to support. For the first time in five years the two biggest clubs in Yorkshire (with respect to Sheffield United, Huddersfield and Bradford) were meeting and for anyone with connections to either club the size of this rivalry is well known. However, it took things to escalate to the point that they did before any real police presence was felt and whilst hindsight is a wonderful thing, the tiny distance between both sets of fans in the corners ended up exacerbating an already heated situation. Lessons can be learned from last night, but in this case being too harsh on South Yorkshire Police would be unfair. Let’s face it, they already have enough to deal with. The anger of the Leeds’ fans was not without provocation, and as such blame must fall partially at the feet of the Sheffield Wednesday fans who chanted and taunted the Leeds fans over the terrible deaths of two of their fans in Istanbul twelve years ago. 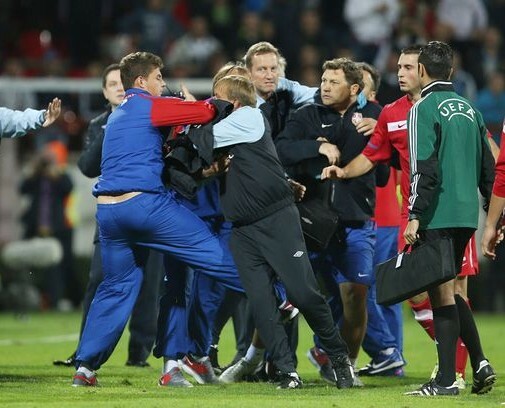 This has no place in football. The time has come for a serious look at the things said and sung by fans. Four years ago Tottenham fans were arrested over the nature of their chants aimed at Sol Campbell. Earlier this season Sir Alex Ferguson called for an end to chanting over both the Munich Air Disaster and the Hillsborough disaster. Yet in the 21st century it is sad that this still occurs, and the FA must take a stand and make it clear that there is a line that cannot be crossed without severe repercussions. Throughout the game, Leeds goalkeeper Paddy Kenny remained remarkably composed when faced with a barrage of taunts over the infidelity of his wife and gained a huge amount of respect from the Hillsborough Kop when his only reaction was a wry smile and the slow pulling down of his shorts in the direction of the guilty fans. But should he, professional footballer or not, have to deal with such personal taunting on a weekly basis? It is time this was stamped out of the game and the FA made it clear that there is a huge difference between supporting your club from the terraces and constantly mocking players for their personal problems and clubs for the tragedies. The FA investigation that has just launched should surely punish Sheffield Wednesday for the part their fans played in inciting the anger of the Leeds United faithful. Unsavoury chanting, though, was neither fair justification for what followed, nor for that matter exclusively from the Wednesday ends. The vile chanting Dave Jones’ referred to in his post match interview relates to songs from the Leeds’ fans regarding accusations of child abuse made against Jones from 10 years ago; accusations emphatically shown to have been totally fabricated. As much as Leeds fans can rightfully feel aggrieved over the chants aimed at them, they are hardly blameless in this matter. In fact, few people can deny that the horrendous scenes televised on Sky Sports last night must be attributed to Leeds United and a small, but not insignificant, section of their support. To cover the obvious perpetrator first, the man who ran onto the pitch immediately following Michael Tonge’s impressive equaliser and struck Chris Kirkland should, and on this point Neil Warnock shows great wisdom, be identified, apprehended, put in prison and banned from ever attending football again. If rumours to be found on the internet are to be believed, the man has been identified and already has a football banning order enforced upon him. If this is true, then more has to be done to enforce this. The overwhelming guilt of this one man does not, though, absolve the rest of the Leeds’ away support from any responsibility. To begin with, the man successfully returned to the stands after attacking Kirkland and was at no point identified to the stewards and police who by that point were ever present at the Leppings Lane end. The section of Leeds’ away support indirectly condoned his act when he was allowed to commit such an act and then avoid being caught. 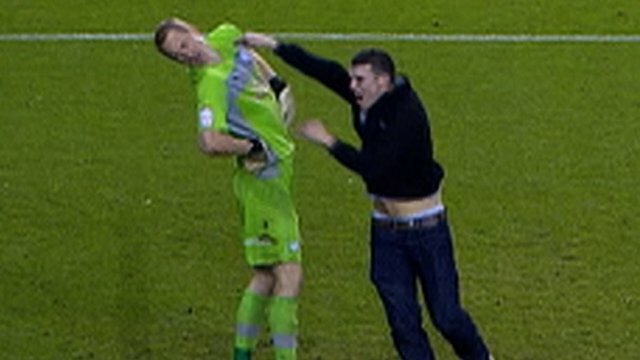 Furthermore, the defining image of the game, the striking of Chris Kirkland, was not an isolated moment of unrest. Seats were ripped out, and along with bottles, thrown at the police and other fans. This surely cannot be attributed to one man’s stupidity, but is indicative of a wider problem that the FA must address. By no means does this writer attempt to say that all Leeds’ fans act in this way. Even the briefest of looks at Leeds United fan forums shows that fans of the club are as shocked and ashamed of what they saw last night as any other person, and for the most part it is a great indignity that they must suffer the consequences of what for the most part they were forced to watch alongside everyone else. 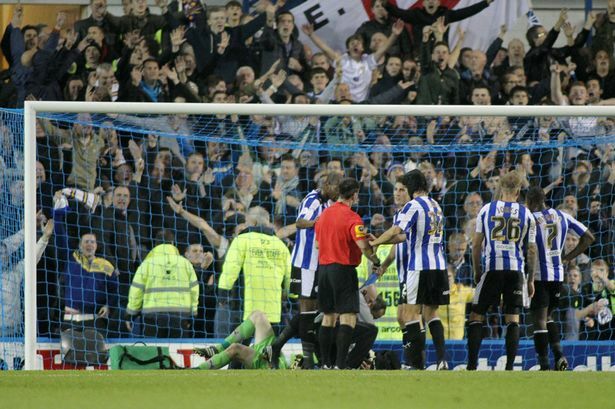 A single section of a single stand on a Friday night in Sheffield does not represent an entire club, but a sizeable enough part of that crowd acted in such a way that it would not be unfair to suggest that Leeds United should be punished to a wider degree than just the single idiot who assaulted Chris Kirkland. How best then to address the situation? A hefty fine would seem the most obvious course of action, yet this would not send the message required. For one thing, fans will not learn their behaviour is unacceptable unless they directly feel the effects of whatever punishment the FA chooses to follow. Secondly, the nature of a fine would be particularly pointless in the specific case of Leeds United. A huge section of the Leeds’ faithful has been engaged in a long period of protest against the running of the club by Ken Bates and as such have even begun to boycott home games to see Bates’ income suffer. To fine them merely helps them to achieve their aims. This being the case, the only course of action that would seem to address the problem directly is to take the attitude that if this is how fans choose to act, then the club should not be allowed to have fans present at their games. If Leeds United were forced to play their next three, five, or however many games the FA would deem fit behind closed doors then it would send a message that fans whose behaviour is this unacceptable will not be allowed at games. Surely once the FA show the world that this is their response to fan unrest then they gain a strong platform from which they can influence UEFA and FIFA to take action when the England National Team are the victim of it in other countries. This entry was posted in Reports and tagged aaron cawley, chris kirkland, dave jones, ferguson, hillsborough, istanbul, ken bates, leeds united, michael tonge, neil warnock, paddy kenny, serbian fa, sheffield wednesday, The FA, uefa by Matt Malone. Bookmark the permalink.